Note: This is a slightly modified pre-publication draft of a chapter in the book Remembering Parthenope: Receptions of Classical Naples from Antiquity to the Present (edited by Jessica Hughes and Claudio Buongiovanni, Oxford University Press, 2015). For anyone with an interest in the complex relationship between the Classical and Christian pasts, the city of Naples offers no shortage of fascinating case studies. Numerous examples have been introduced in this volume already, from the use of Roman spolia in medieval churches (Palmentieri, Chapter 6) to the juxtaposition of the thirteenth-century cult of the magician Virgil with that of S. Maria dell’Itra in the Crypta Neapolitana (de Divitiis, Chapter 10). This chapter will focus on another example from the religious material culture of more recent periods – the world-famous and highly theatrical representations of Christ’s nativity that are displayed in the city’s homes and churches every Christmas, the components of which are sold throughout the year in the shops on Via S. Gregorio Armeno in the historic centre. These miniature tableaux, which are known as presepi (singular presepe), ‘cribs’, set the nativity against an eclectic and bustling pageant of Neapolitan life across the ages, performed by a cast of characters drawn from history and contemporary popular culture. Every year, the Holy Family is joined by new local and global personalities, from musicians and actors to politicians and footballers. Perhaps unsurprisingly, it is the presence of these anachronistic and often humorous figurines that has dominated the attention of most observers; this chapter, however, shifts the focus onto the scenographic background of the presepe, and in particular the representations of classical ruins against which this definitively Neapolitan version of the nativity is enacted . The chapter begins by laying out some brief historical background to ruins in the presepe, moving from the scattered and partial glimpses in texts of the seventeenth and eighteenth century to the much fuller material record of the nineteenth, twentieth and twenty-first centuries. After introducing this evidence, it moves on to explore the following question: why did classical ruins become – and remain – such a central component of the presepe napoletano? The answer to this question is multi-layered for, as we shall see, ruins in this context have several possible functions and meanings. For instance, while the initial introduction of ruins can be seen to reflect a broader contemporary interest in classical culture, inspired by the rediscovery of sites such as Pompeii and Herculaneum, these models also link the presepe to much older religious uses of ruins as symbols of Christian victory over paganism; meanwhile, within the unique context of the presepe, the classical ruins contribute to a more general sense of historical anachronism that many commentators have seen as the genre’s most distinguishing feature. In recent times, the popularity of ‘esoteric’ approaches to the presepe have confirmed the ruins’ role as a bearer of symbolic meaning, while – as the study of individual examples can show – the inherent ambiguity and polyvalency of the ruin has allowed it to be continuously adopted and adapted into new visual narratives about other sorts of contemporary decline and survival. In this way, the chapter brings our study of Neapolitan receptions of antiquity right up to the present day and into popular culture, showing how the classical past of Naples continues to be reshaped by the city’s inhabitants and given powerful and provocative new meanings. Most existing descriptions and historical studies of the presepe focus not on scenographic elements like the ruins but on the figurines (pastori), which are normally discussed and illustrated in isolation from their ‘backdrops’ . This dominant, decontextualised approach to the figurines can be explained in part by the fact that presepi are traditionally dismantled and re-made on an annual basis, which of course increases the chance that the figurines will become permanently separated from their original display contexts. In turn, the backdrops themselves are often fabricated from relatively cheap, ephemeral materials such as cork, wood and papier-mâché, so conservation is also an issue. In fact, only a handful of historic examples of presepe scenographies survive – others have left traces in other written or visual sources, most of which are collected in Gennaro Borelli’s detailed 2001 study of the Personaggi e scenografie del presepe napoletano. One of the earliest scenographies of which we have record was erected in 1627 by the Padri Scolopi in their church of the Nativity of Jesus; nothing survives of the backdrop itself, but an account written in 1721 by the Jesuit priest Giuseppe Patrignani mentions that it included a scene of the annunciation to the shepherds and ‘una prospettiva in lontananza’ . Near-contemporary descriptions of other presepi record representations of the osteria (often transformed into a representation of one of the city’s many taverns) to which Mary and Joseph were refused access, and – most importantly for us – of sparse, natural landscapes, dotted with the ruins of classical buildings . Some of the earliest examples of classical ruins in the presepe are found in a painting made in the last quarter of the seventeenth century, for display in the church of S. Giovanni a Carbonara . Executed by an unknown artist, it formed a replacement background for a series of life-size wooden figures sculpted in the fifteenth century by the brothers Pietro and Giovanni Alemanno. These wooden figures are preserved today in the Museo S. Martino in Naples, and comprise one of the most precious documents in the history of the presepe napoletano. Unfortunately, the painted backdrop itself was destroyed in World War II, but reconstruction drawings made from pre-war photographs indicate that it included a bare landscape with a scattering of dead trees and a tower amongst a few rural farm buildings. In the background are hills and the remains of a Roman aqueduct. As Gennaro Borelli points out in his discussion of this painting, the scene draws on the seventeenth-century tradition of Neapolitan landscape painting, but is also reminiscent of ‘real’ local landscapes, such as the countryside visible beyond the Via Foria, which included the remains of the Roman aqueduct known today as the ‘Ponti Rossi’. While scattered references suggest that ruins did occasionally appear in early eighteenth-century presepi, we have much more evidence for the later part of that century . For instance, we know that ruins appeared in what was perhaps the most famous domestic presepe from that period – that belonging to the Terres brothers, a family of booksellers and publishers with a workshop in Via S. Biagio dei Librai, opposite the church of SS. Filippo and Giacomo . Designed in April 1785 by the architect and presepista Francesco Viva, it was subsequently viewed and described by several elite visitors to the city . An engraving by the French artist Dominique Vivant shows a detail taken from the Terres crib: it depicts a family resting next to a ruined classical column covered with lichen and plants; just visible in the background to the left is a circular temple vaguely reminiscent of the temple of Cybele in Rome. A description of this elaborate crib written in 1787 by the count Joseph Gorani records that it included other references to the material culture of antiquity, in the form of ‘amphorae, classical statues and Etruscan urns’, as well as the ruins of a Roman aqueduct . Dominique Vivant Denon, family group. The inscription reads ‘Preso dal presepio de S. I Terres compost da Francesco Viva Napoli nel mese d’Aprile del anno 1785’. Naples, Museo Nazionale di San Martino. The representation of antiquities in the Terres crib might be seen as continuing a trend that had begun in earnest three years earlier in 1782. This was the year in which the Neapolitan architect Gaetano Barba had been commissioned by the Confraternity of S. Giuseppe dei Falegnami to make a new setting for another group of older wooden figures – this time those sculpted by the sixteenth-century artist Giovanni da Nola (see Chapter 10 of this volume for a discussion of these figures in their original context of the church of S. Maria del Parto) . Again, Barba’s updated scenography no longer survives, but contemporary descriptions indicate that it depicted the ruins of an ancient temple complete with ceiling coffers, Corinthian columns and miniature representations of sculpted reliefs found in local excavations . Historiographical studies of the presepe often repeat the statement that Giovanni da Nola was the first artist to introduce ruins into the presepe; for example, in an early study of the genre that was published in the Atti dell’Accademia Pontiana in 1889, Francesco Proto (duke of Maddaloni) explained how Giovanni ‘recoiled from representing the Saviour’s birth in a crypt or stable, instead placing the manger amongst the debris of a pagan temple’ . He continued: ‘It is in this presepe of Merliano, then, that we find the origins of our own unique presepi. Many of the examples I’ve seen rise from the rubble of a pagan temple. I myself had one made this way, back when I built presepi before entering into politics…’ . The ‘Presepe Cuciniello’. Naples, Museo Nazionale di San Martino. Proto’s words here raise the possibility that contemporary and later viewers erroneously identified Barba’s eighteenth-century backdrop as the work of Giovanni da Nola himself. They also suggest that ruins were widespread in presepi of Proto’s own time – a suggestion that finds confirmation in a series of surviving nineteenth-century examples. Ruined classical architecture is at the centre of what is perhaps the most famous Neapolitan nativity of all time – the presepe Cuciniello – which can be seen on display today in the Museo S. Martino . This stunning tableau was first assembled in the kitchens of the Certosa di S. Martino on the 28 December 1879 by its donor, the Neapolitan playwright Michele Cuciniello, with the help of the dramaturge Luigi Masi and the architect Fausto Nicolini. It locates the nativity against a background of classical ruins; pieces of broken columns lay strewn on the floor while a miniature sculpted bas-relief decorates the archway. The Museo S. Martino also houses a particularly intriguing example of a nineteenth-century presepe with ruins: the so-called presepe di sughero (‘cork nativity’), which was designed and executed by an engineer in the service of Ferdinand II named Lorenzo Taglioni. This presepe – currently in storage awaiting restoration – consists of more than two hundred figures dressed in contemporary local costumes; it is encased in a calibrated mechanism almost two metres long which, when closed, takes the form of the Temple of Neptune at the nearby site of Paestum . It is unusual in many respects – for one thing, the temple model rests on a faux-marble half column with a hidden music box that plays a lullaby. And while in all the other presepidiscussed in this chapter the ruins are one of numerous miniature elements set within a complex landscape, the presepe di sughero inverts this relationship so that the classical architecture dominates the scene, becoming the frame for the entire presepe and all its inhabitants. ‘Presepe di sughero’ (cork nativity), exterior. Naples, Museo Nazionale di San Martino. 'Presepe di sughero' (cork nativity), interior. Naples, Museo Nazionale di San Martino. The selection of sources discussed so far gives some useful historical background to ruins in the contemporary presepe, allowing us to identify ways in which the older tradition is both continued and transformed in the modern examples. Today, the home of the presepe napoletano is the street of S. Gregorio Armeno, which winds its way from the church of the same name past the remains of the Roman market underneath the church of S. Lorenzo Maggiore towards the isolated Roman column that stands at the corner of Vico Figurari . The shops of Via S. Gregorio Armeno and the neighbouring Via S. Biagio dei Librai sell an impressive and ever-changing array of different figures destined for presepi, which are normally made from terracotta but sometimes from other materials such as plaster and plastic. While the range of presepe ornaments is vast and eclectic, certain categories of figurine and accessory appear in most of the different shops: these include the principal protagonists of the nativity story, other stock figures such as the street sellers with a range of traditional produce (watermelons, fish, chestnuts, and so forth), and the models of ancient ruins that are the focus of this chapter. The modern ruin models come in different formats. Some are incorporated into larger models that provide a static background against which collections of figurines can be arranged, while others are sold as individual miniature components that can be taken home and added to existing panoramas. Others still appear in smaller scenes featuring the Holy Family that are sold ready-assembled inside glass boxes or domes (scarabbatole). In all cases, the most common type of ruin is the classical column, which is often shown surmounted by a Corinthian capital. The columns are represented either singly or in groups of three or four. In the latter case they are generally surmounted by an ornate entablature – an image loosely reminiscent of the iconic group of three columns belonging to the ruined Temple of Castor and Pollux in the Roman Forum . Another popular category of ruin is the broken arch, which is commonly shown as made of decaying brick; as Alessandra Griffo has pointed out, these arches visually echo the remains of the city’s aqueducts, like the one that brought the water of the Serino to Naples and Baiae (see de Divitiis, Chapter 10 of this volume) . View of presepe merchandise on sale in Via S. Gregorio Armeno, including figurines of Pulcinella and S. Gennaro. The central role of classical ruins in the contemporary presepe was brilliantly demonstrated by a figure that was on sale in S. Gregorio in the winter of 2011. This model belongs to a category of motorised ceramic figurines that can be attached to a power supply and animated via an internal mechanism. They are set within small tableaux representing shops or work areas, and are normally articulated at the waist or shoulders, thus allowing their upper bodies and arms to move rhythmically backwards and forwards. Most of the activities and professions that are represented in these animated models also feature in the traditional Neapolitan presepi: so we find men shearing sheep, making copper pans, cutting hair, chopping logs, and making bread and pizza, while women are depicted washing, ironing clothes and slicing watermelons. This particular model was made in the workshop of C. Fusco (Via S. Gregorio Armeno 7); it represents a craftsman seated within a rustic alcove, behind a table on which rest a terracotta vase, sculptor’s tools and some half-finished models of classical columns. When the model is plugged into an electrical supply, the sculptor’s right arm moves up and down to raise and lower the paintbrush in his hand; it thus constitutes a clever, self-reflexive representation in which a presepe maker (figuraro or plasticatore) is shown fabricating a series of new (but artificially antiquated) columns destined for inclusion within an imaginary ‘meta-presepe’ on an even smaller scale than the crib that the figuraro himself is destined to occupy . 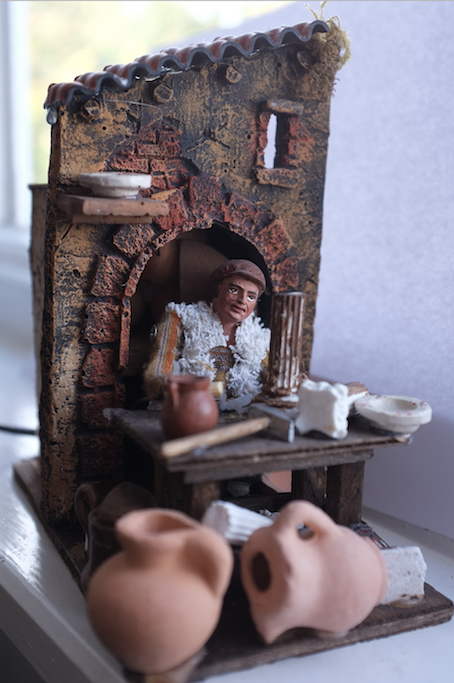 Mechanised figurine of a figuraro (presepe maker), bought in S. Gregorio Armeno, Christmas 2011. Why did classical ruins become – and remain – such a central and enduring component of the presepe napoletano? Clearly, on one level their introduction and subsequent development reflects a much broader contemporary interest in the material culture of classical antiquity, which followed the rediscovery of archaeological sites such as Pompeii and Herculaneum . As Annalisa Marzano has already discussed in her chapter in this volume, these rediscoveries exercised a powerful influence over all genres and aspects of eighteenth-century artistic and architectural production . The ruins in the presepe clearly need to be considered alongside other classicising objects of this period, and indeed there are often connections to be made between these different forms of material culture: the presepe di sughero, for instance, responds to a vibrant eighteenth-century tradition of representing the Paestum temples in different media, while the landscapes of many other presepe frequently bear similarities to paintings, engravings and theatrical backdrops in the popular eighteenth-century genres of rovinismo and capriccio . The Vision of the Emperor Augustus and the Ruins of the Temple of Peace, c. 1400, tempera. Stuttgart, Staatsgalerie. However, while the contemporary passion for antiquity may have provided one obvious impetus for the development of presepe ruins over the course of the second half of the eighteenth century, it certainly cannot be seen as the sole motivating factor. Each of the strands of classical reception in this period had its own, internal history of development, as well as its own specific sets of meanings: within the context of Christian material religion, classical ruins had already been appropriated for centuries as a means of indicating the triumph of Christianity over the ruins of paganism. 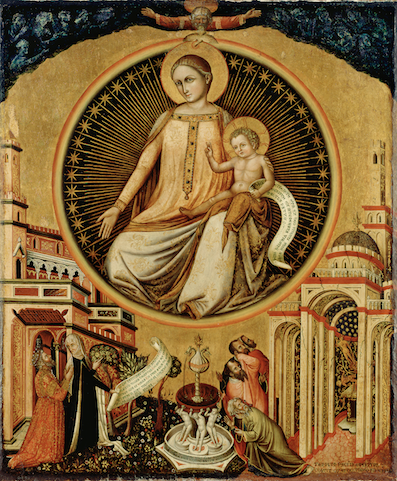 The image above shows one early example – a painting in tempera dating to around 1400, which represents a tale that appeared in the late medieval collection of hagiographies known as The Golden Legend . This tale told of the destruction (forewarned by an oracle of Apollo) of the Roman temple of Peace on Christmas day; as Salvatore Settis has noted in relation to the same painting, the narrative ‘presented the ruins of ancient Rome and its idols and temples as a direct consequence of the Incarnation of Christ’ . In the painting, most of the visual field is occupied by a gigantic vision of Madonna and Child suspended in the sky; at the bottom left of the painting, the Emperor Augustus (in red) falls to his knees, while on the right a group of Roman nobles watch in consternation as cracks appear in the walls of their precious temple. Other fifteenth-century examples of ruins in nativity scenes include Botticelli’s several versions of the Adoration of the Magi (1478-83), Ghirlandaio’s Adoration of the Shepherds in the Sassetti chapel in the Church of the S. Trinità in Florence (1485), and the Adoration of the Shepherds painted by Francesco di Giorgio Martini in 1493 for the Church of S. Domenico in Siena; later Neapolitan examples include paintings by Francesco Solimena (1657-1747) and Filippo Falciatore (1718-68) . Ruins and fragmentary sculptures were also used to illustrate Christian victory over paganism in other Christian contexts (besides representations of the nativity) . Fulvio Lenzo has already described in this volume how, in the sixteenth and seventeenth centuries, the architecture and sculptures from the ancient temple of the Dioscuri were presented by the Theatins as symbols of Christian triumph, while in earlier periods the gap in this church’s pediment had been seen as physical proof of legends about St Peter’s visit to the city, when he made the pagan images of Castor and Pollux fall to the ground . We might also recall that the ceiling of S. Paolo Maggiore featured a painting by Massimo Stanzione in which the collapsed ancient temple of Castor and Pollux was represented in the form of three truncated classical columns – an image that finds strong visual parallels in the ruins in the presepe. This example of the church of S. Paolo intimates how the classical cityscape of Naples might have interacted with the models of ruins in the presepeto confirm and adumbrate their primary symbolic meaning, guiding the city’s inhabitants and visitors to read these miniature fallen columns and arches as further illustrations of the triumph over the falsis diis of pagan antiquity. Proto’s provocative commentary clearly aims to contrast the wisdom of earlier artists with the relative ignorance of his own age, but later discourses about the presepe continue to attribute the ruins with precisely the same theological meaning. Today, the association of the ruins with the fall of paganism is repeated in books and websites dedicated to presepi, as well as circulating in oral tradition and internet discussions . In fact, this widespread interest in, and agreement about, the symbolic content of the ruins may provide us with another reason for their continued popularity. Recent years have witnessed a growth of interest in the so-called simbologia of the presepe – a hermeneutic approach that sees every individual element of these scenes as containing a hidden meaning beyond its literal appearance. This symbolic approach is used to structure Robert De Simone’s best-selling 1998 study Il presepe popolare napoletano, in which the author, a well-known Neapolitan ethnographer and musicologist, lists the various figures and elements of the presepealongside explications of their deeper symbolic meanings . We learn, for instance, that the image of the bridge refers to the passage from life to death, while the image of water (contained within the presepe in both rivers and tubs) symbolises the rivers of the Underworld, the wine (sold by traders and drunk in the taverns) stands for the Eucharistic blood of Christ, and so forth. Particularly fascinating in the present context is the claim that certain figures represent the classical pagan gods in disguise: so the popular image of an old woman giving corn to a hen is representative of Demeter (the hen is Persephone), while the spinning women are the Fates, the hunter is Apollo, and the old man and woman sitting by the fire represent Saturn and Rea . Space does not permit a full discussion of these ‘hidden gods’ in this chapter, but it is worth noting that the continued presence of these classical deities in the presepe may problematise the simple equation of the model ruins with the death of ancient paganism. More generally, we can see how this rich system of hidden meanings – which contains frequent overlaps with another Neapolitan tradition, the oneiric smorfia – both absorbs and perpetuates the older allegorical meaning of the ruins, which now become one of the more transparent aspects of a broader, and increasingly esoteric, system of symbolic representation . Further insights into the role played by the ruins can come from looking at the presepe’s internal aesthetic of historical ‘layering’ and anachronism . It is true that the attendance at Christ’s birth by worshippers dressed in the costumes of later periods is a prominent feature of nativity paintings from other parts of Europe; however, this aesthetic of temporal collapse was both emphasised and accentuated in the Neapolitan presepe – to such an extent that it became, for some observers, its most distinctive feature. When Joseph Gorani viewed the nativity belonging to the Terres brothers, he expressed his shock at finding the birth of Christ represented alongside events and people rooted in much later periods of history: these included Capuchin monks, Jacobins and nuns, and the archbishop of Naples depicted in the act of stopping an eruption of Vesuvius by displaying the blood of the city’s patron saint, S. Gennaro. This relaxed attitude to chronology extended to the representation of the climate and landscape too: for ‘instead of offering to the viewer the season of winter and the harshness that accompanies it, one’s eyes rest on a nature embellished with the charms of spring, and on the gifts of Ceres as well as those of Pomona….’ Meanwhile, ‘further off one sees mountains and plains covered with snow, frozen ponds and trees with bare branches, while right next to them are leafy trees with fruit ripe for the picking’ . In many ways, the modern presepi appear even more insistently anachronistic and full of contrasts than their predecessors, thriving as they do on the stylistic and iconographic clashes between the older figurines (pastori) and the often garish portrait images of today’s celebrities. Virtually all the figures and accessories in the contemporary cribs belong to periods much later than the central scene of Jesus’ birth (notable exceptions include models of Roman centurions, and wagons decorated in the style of Pompeian wall-paintings). The Holy Family and core cast of traditional pastori – who are often dressed in mock eighteenth-century vestments – are joined by other more recent symbols of the city, including the ‘sacred triad’ of Neapolitan writer-actors, Totò (1898-1967), Eduardo De Filippo (1900-1984) and Massimo Troisi (1953-1994). In addition to these familiar figures of Neapolitan cultural memory, the workshops of S. Gregorio produce a constant stream of new pastori drawn from current events happening in Naples, elsewhere in Italy and around the globe. By the festival of the Epiphany on 6 January 2013, for instance, the shops already included figurines of the eminent Nobel-prize-winning Italian scientist Rita Levi-Montalcini, who had died the week before, former president Silvio Berlusconi with his new (Neapolitan) girlfriend Francesca Pascale, and the visibly pregnant British Royal, Kate Middleton, whose condition had been announced only a few weeks earlier. The anachronistic aesthetic of the presepe napoletano has been recognised by many different observers as one of the crib’s central and definitive features – and while Joseph Gorani lamented how, within the Terres presepe, ‘the objects represented did not bear any resemblance to the objects they were meant to represent’, more recent commentators have interpreted this temporal and chronological bricolage as having a deliberate theological significance . The Neapolitan theologian and ecclesiastic Bruno Forte, for instance, suggests the overarching message of the city’s presepi is that ‘Christ is not born ‘elsewhere’ or ‘in a far-off time’, but ‘here and now’, in ‘his’ land and amongst ‘his’ people, who are authentic and incredibly faithful’ . Similarly, Marino Niola has explained how ‘at heart, the anachronism of the presepe embodies an allusion to the fact that the Nativity is re-lived in every era – that the Good News continues to broadcast, but that it can only do so with new words, otherwise it risks becoming cold dogma, stiff ‘historification’’ . It is in relation to this pervasive aesthetic of historical anachronism that the image of the classical ruin plays one of its most important roles, since the rich chronological layering of the presepe is both reflected in, and amplified, by the ruin’s own complex temporal identity. As recent scholarly work on ruins in other contexts has shown, such images of fragmented buildings can embody references to several different temporal moments, including the time of their original manufacture and the time of their destruction . This destruction can, in turn, be conceived of as a single, synoptic act, and/or as a longer process of decay, such as that we might see in the Vivant engraving, where a crumbling column is covered in slow-growing lichen. In this way, the image of the classical ruin can be seen to both encapsulate and augment the complex multi-temporality of the presepe, not only by embodying a number of discrete historical moments, but also by simultaneously uniting these different historical moments through the evocation of an ongoing, linear process of ruination and decay. This same sense of time passing can be seen in other iconographic and performative components of the presepe, such the use of electric light to mimic the (accelerated) passing of day and night, and the explicit evocation of human biological decay in the hyper-veristic faces and bodies of the pastori. These latter representations of the ‘ruin of the body’ serve to emphasise the ephemerality and unrepeatability of normal human existence – qualities that stand in stark contrast to the eternal, recursive nature of the birth of the Christian Saviour . Each of the factors discussed so far has engaged with the presepe napoletano as a genre, focusing on aspects of ruins that apply to a wide range of historic and contemporary examples. However, when we turn to focus on individual presepi on display in the city today, we often find the ancient ruins being appropriated in unique and unexpected ways, often appearing in the context of visual narratives motivated by a broader socio-political agenda. As we might expect, some of these uses hinge on the innate capacity of ruins to encapsulate narratives of decline, evoking dismay and nostalgia in their viewers. For example, in a scene on display outside one of the S. Gregorio workshops in December 2012, a large model of classical columns topped with a crumbling entablature was incorporated into an assembly of motifs that was very hard not to read as a pessimistic comment on the current ‘state of the nation’. The central position was given to the figures of Eduardo De Filippo and Totò, each holding one of his catchphrases on a placard. Eduardo’s read Povera Italia!! !, Totò’s E Io Pago!!! (‘And it’s me who pays’). When viewed together with the background of disintegrating architecture, at the end of a year marked by economic problems and political scandals – as well as concerns about the region’s archaeological heritage – these phrases acquired an altogether more poignant level of meaning. One particularly rich example of a contemporary reception of classical ruins is represented in the image below. This photograph reproduces a view of a presepe that was made in the Ferrigno workshop in 2009 (Via S. Gregorio Armeno 8), the same year in which the town of L’Aquila (the capital of the Abruzzo region of Italy) was struck by a catastrophic earthquake . 300 of the city’s inhabitants died in the disaster, and more than 65,000 were left homeless; countless historic buildings were also destroyed. The ensuing rescue operations were based in the barracks of the Guardia di Finanza (the special branch of the Italian police force which deals with economic affairs) in the nearby village of Coppito, and it was in the Guardia di Finanza headquarters that the Presepe per L’Aquila was displayed before being sold in a special charity auction, the proceeds of which went to the victims of the earthquake. The photograph reproduced here depicts the Presepe for L’Aquila when it was still on display in the Ferrigno shop in Naples. Measuring approximately 2.5 metres in length, it portrays Mary, Joseph, Jesus and the Three Kings set against a background of classicising ruins. So far, so traditional – however, a closer look reveals that the scene of the divine birth has been cleverly reconfigured to include references to the earthquake and its aftermath. The Three Kings are dressed in eighteenth-century costumes, but they have the recognisable physiognomies of the political leaders who played a role in the rescue efforts: the then-president Silvio Berlusconi, Guido Bertolaso (head of Italy’s civil protection department) and General Fabrizio Lisi (the Head of Coppito’s Guardia di Finanza). The American president Barack Obama, whose offer of international aid was one of the few accepted by Berlusconi, also appeared as a shepherd tending his sheep. But the most striking aspects of the representation in the present context are the ‘classical’ ruins, which have been replaced here by models of L’Aquila’s most iconic buildings in their post-earthquake state. The building at the centre of the presepe in front of which the Holy Family gathers represents the eighteenth-century church of S. Maria del Suffraggio – one of the most important churches in the city, and one of the most badly damaged in the disaster. The building on the left represents the Scuola della Guardia di Finanza in Coppito; finally, although the columns and architrave of the building on the right assimilate it visually to the classical ruins that would normally appear in a presepe, the inscription on the architrave clearly identifies this structure as the collapsed Palazzo del Governo. The Presepe per L’Aquila, 2009, Ferrigno workshop, Naples. The Presepe per L’Aquila thus provides us with one of the most striking examples of how the classical ruins might be reconfigured by modern Neapolitan artists and incorporated into narratives that are resolutely contemporary. As in earlier examples, these ruins contribute to the sense of historical anachronism, albeit through the representation of Neoclassical buildings which were until recently still functioning. At the same time, the identification of these ruins with real buildings – made explicit through the textual labels – also collapses space by creating a fantastic capriccio of recognisable buildings that stood miles apart in reality. Crucially, this depiction of an identifiable architectural context serves to relocate the nativity from Bethlehem to L’Aquila, showing the Abruzzo city as the (true) birthplace of the Christian religion . Here, the presence of the Holy Family in the disaster-struck town might be seen to provide a source of potential comfort to its citizens, by showing the divine birth and its saving power as physically present amongst them . Moreover, as well as functioning to transport the Holy Family to L’Aquila, other elements within this presepe also suggest that the ruins themselves should be read as symbols of hope and redemption. This reading is most explicitly signalled by the Latin phrase above the door of the Scuola della Guardia di Finanza, which reads Nec Recisa Recedit - ‘No retreat, even when broken’. This phrase – in fact the Guardia’s motto – was noted and discussed by Pope Benedict XVI during his visit to the city on 28 April 2009 when, standing outside the building, he suggested that Nec Recisa Recedit ‘seems to express well what the mayor defined as your firm intention to rebuild the city, with the constancy that characterises the people of the Abruzzo region’ . The pope appears in the Presepe per L’Aquila, his arms uplifted in a physical gesture of optimism and encouragement: this gesture thus mirrors the pervasive optimism of his speech, which closed with an expression of hope that the town of L’Aquila (lit. ‘the eagle’) would ‘rise up and fly again’. Although on one level, then, the depiction of recognisable ruins in this presepe appealed to the viewer’s profound awareness of loss, it also functioned to enhance the presepe’s function as a symbol of hope, comfort and redemption. This dual nature dovetails neatly with comments made by Page duBois, who has drawn attention to the fundamental ambiguity of ruins and their potential to ‘evoke fears of decay and death, even as they promise survival and even immortality’ . The Presepe per L’Aquila thus cleverly plays with the deep-rooted ambivalence of the image of the ruin, which is here used not only to evoke a sense of sadness and nostalgia at the destruction of familiar historic buildings, but also to write those buildings into a more positive narrative of rebirth and renewal. Essentially, this presepe appropriates and overturns the ‘accepted’ allegorical symbolism of the ruins, which – as we saw earlier – posits them as unproblematic symbols of the triumph of Christianity over paganism. The central ruined building represents a Catholic church rather than a classical monument; meanwhile, rather than indicating the complete replacement of one obsolete civilisation by another (as the simbologia of the modern presepe would decree) the ruins in this example are transformed into a symbol of the survival and continuity of a single (Christian) civilisation in the face of unavoidable natural disaster. The Presepe per L’Aquila thus demonstrates the agency of modern figurari to appropriate the traditional imagery of ruins for new meanings, while reminding viewers of the richness and multivalency of the ruin as a symbol of Classical Presences. A good starting point for study of the presepe napoletano in English is the collection of essays in Dickerson and de Cavi (2008). Mancini (1983) is an invaluable source of historical accounts of presepi from the eighteenth century to 1955. The historical and art-historical development of the presepe has been the central theme of most existing studies: see for instance Borelli (1970), (1991), (2001); Catello (1991); Griffo (1996); Grillo (1998); De Caro (2007). Forte (1999), De Simone (1998), Niola (2005) and Franchesi (2006) provide more theoretical and anthropological perspectives. Calaresu (2013) looks at presepe figurines in the context of a broader study of the representation of street life in eighteenth-century Naples. This is despite the fact that these backdrops – often elaborate, multi-part constructions – have been of crucial importance in defining the genre, and in distinguishing the presepe napoletano from other crib traditions both around Italy and internationally. On the relationship of the Neapolitan presepe to other European nativities see Dickerson and de Cavi (2008), 1-5; Fittipaldi (1979), 13. For an introduction to the very different traditions of nativity scenes from other parts of Italy see Ruggiero (1988). Franchesi (2006) takes a case-study approach to presepi in the province of Padova. For a comparative view of nativity scenes from around the world, see Govan (2007). Patrignani (1721), 34. See Borelli (2001), 23 with the reconstruction drawing at Fig. 1. As Borelli explains, this presepe inspired a series of similar cribs in Naples over the subsequent years, including the one set up by the Jesuits in 1630 in the church of Gesù Nuovo, and another assembled in 1633 by the notary Andrea Cassetta (one of the first recorded ‘domestic’ presepi), and the presepe erected at Christmas 1661 in a hut in the church of S. Paolo Maggiore. Borelli (2001), 24. He notes that the earliest record of a tavern scene occurs in the context of a presepe that the Saavedra family exhibited from 1656 in their chapel in the church of St. Peter of Murcia in Spain (where many Neapolitan presepi were sent). Borelli (2001), 24 with Fig. 2a. 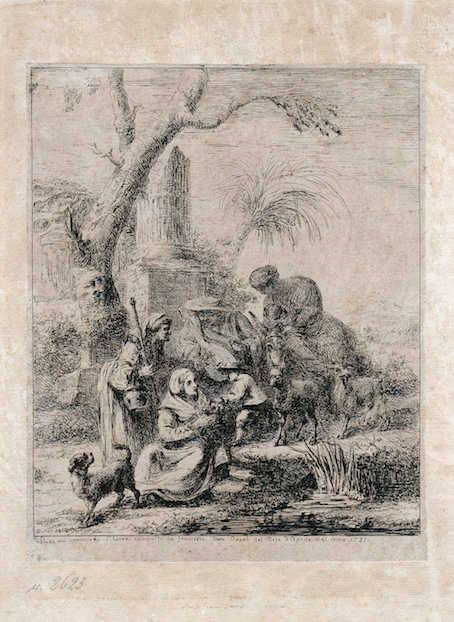 The first half of the eighteenth century yield few references to classical ruins, although Borelli suggests that a drawing of a fantastical ruined building signed by the Neapolitan artist Luca Giordano may have been a preparatory design for a presepe – possibly that erected in the church of S. Brigida by Razionale Antonio Ciappa. Borelli (2001), 25 with pl. 1. Borelli (2001), 29-30; Niola (2005), 63-65. For Viva see Fittipaldi (1979), 22. Scalfaro (2005); Laschke and Deramaix (1992), 30. Proto (1889), cited in Mancini (1983), 62-70. ‘I presepi casalinghi moltiplicaronsi dopo quello che adorna l’altare di S. Giuseppe dei Falegnami, opera bellissima del nostro gran Marliano. Il quale, schifando far nascere il Redentore in una cripta, in una stalla, mise la mangiatoia e la cuna fra le anticaglie di un tempio romano.’ Mancini (1983), 66. ‘Dei quali molti ho veduti, sorgenti dallo sfasciume di un tempio del gentilesimo. Io stesso ne avevo uno cosiffatto, quando, prima di dar nella politica, costruiva anch’io il presepe…’. Mancini (1983), 66. Stefanucci (1944), cited in Mancini (1983), esp. p. 294: ‘Uno stormo d’angeli si libra sulla rovina pagana della nascita’. Creazzo (2005), 22-23, 34 n. 8; Palladino (2002), 162-5. When closed, the model measures 198cm in width, 56cm in height, and 105cm in depth (without the column). The same Paestum temple along with other ruins of Doric architecture was represented in a drawing for a presepe background also now in the Museo S. Martino (inv. no. 20527). See Borrelli (2001), 31. The site of the church of S. Gregorio Armeno may have been occupied in antiquity by a temple to the goddess Ceres, who was the recipient of small votive statuettes produced in this area. In 1234, there was an influx of Franciscan monks, who built a small church on the site that later became the church of S. Lorenzo Maggiore. St Francis is commonly cited as the originator of the nativity tradition (he built one of the earliest recorded examples in town of Greccio in Lazio in 1223), and some have argued that it may have been the combination of this Franciscan tradition – mediated by the monks of the Order – with the ancient manufacture of small votive figurines, which led to the development of the presepe industry in the area of S. Gregorio. On St Francis and the nativity see Beretta (2003). A long-standing source of inspiration for artists portraying ruins. Examples include Claude Lorrain’s painting of the Roman Forum, 1633-1634, illustrated at Zucker (1968), 52-3 and Pierre Lemaire’s Ancient Corner of the Forum, illustrated at Zucker (1968), 54-55. C. Fusco, Via S. Gregorio Armeno, 7, http://www.artedelpastore.it [accessed 24 March 2014]. On the reception of Pompeii from its rediscovery to the present see Cremante et al. (2008); Hales and Paul (2011); Mattusch (2013), with further references. Other examples of eighteenth-century receptions of antiquity in Naples are discussed in the collection of essays edited by Ceserani and Milanese (2007). Mattusch (2013) illustrates many examples: see in particular the chapter on ‘Flying Maenads and Cupids: Pompeii, Herculaneum and Eighteenth-Century Decorative Arts’ by Nancy H. Ramage (pp. 161-170). On the eighteenth-century rediscovery of and passion for Paestum, see Ceserani (2012), who also discusses Piranesi’s highly influential engravings of ruins. On rovinismo in theatre scenographies see Mancini and Simonelli (1992). Griffo (1996), 26-27 points out parallels between ruins in a painting by Falciatore and a presepe in a Neapolitan private collection. For further examples of nativities with ruins see Makarius (2004), 28-41; Settis (2011), 723-726. See for instance Buddensieg (1965) on the destruction of pagan idols by Gregory the Great. See the discussion in Chapter 12 of this volume. Gaetano of Thiene (1480-1547), one of the founders of the Theatin order, was in fact an early promoter of the presepe: see Griffo (1996), 11. ‘Certo, Giovanni di Nola volle significare come sulle ruine del gentilesimo sorgesse l’evo novello. Né ci è che dire. Tutti quei nostri grandi artisti eran più o meno filosofi, tutti bene o male eruditi in teologia ed in agiografia. E se no, a filosofi e teologi si ispiravano. Che volete? Non vi avea, di quei giorni, tutta questa moltiplicità di scuole, sottosculoe e soprascuole, che noi paghiamo; ma si studiava. Ed, a differenza del tempo nostro, quelli che non sapevano, non eran poi così sori, da non addarsi, che vi ha per il mondo chi sappia e chi possa largheggiar di consiglio con gli indotti.’ Proto (1889), cited in Mancini (1983), 62-70. De Simone (1998); see also Widman (2004), who uses the simbologia to formulate a Jungian analysis of the presepe. On the smorfia see De Sanctis Ricciardone (1987). Niola (2005) contains a suggestive discussion of anachronism in the presepe napoletano. ‘Si percepisce che l’oggetto rappresentato non ha nessun rapporto con l’oggetto da rappresentare’. Gorani (1793), cited in Mancini (1983), 23. ‘Cristo non nasce ‘altrove’ o ‘in un tempo lontano’, ma ‘qui ed ora’, in questa ‘sua’ terra e fra questa ‘sua’ gente, autentico e fedelissimo ‘Dio-con-noi’.’ Forte (1999), 41, cited in Niola (2005), 71. ‘In fondo l’anacronismo del presepe rappresenta un’allusione al fatto che la Natività è rivissuta in ogni epoca, che la Buona Novella continua a dirsi, ma non può che farlo con parole nuove, pena il diventare dogma algido per un verso, e ‘storificazzione’ ingessato per l’altro.’ Niola (2005), 69. On the complex relationship of ruins to temporality see Lowe (2012); his article focuses on images of classical ruins in computer games, but several of his points also resonate with the ruins in the presepi: for instance, he points out that many games set in the past that use ‘already old’ relics, which thereby function to create a ‘double-layered’ interaction with the ancient world. Lowe (2012), 63. The phrase ‘ruin of the body’ is borrowed from duBois (2011). For duBois, much of the poignancy of the ruins comes from the fact that ‘the viewer also inhabits a ruin, a body that is doomed to decay and death, destruction that ends with bones and ashes’. duBois (2011), 668. For the Ferrigno workshop see http://www.arteferrigno.it [last accessed 24 March 2014]; De Caro (2007), 14. This ‘relocation effect’ had been a feature of earlier examples too, not only through the inclusion of ruins but also through the representation of topographic features, including representations of the Bay of Naples and the image of a smoking Vesuvius (as seen, for example, in the background of the presepe Cuciniello). Local poet, Filippo Crudele, likened the homeless citizens of L’Aquila to the Holy Family on their search for a place to stay in Bethlehem: ‘A Natale, come sarà / Il nostro Presepe? / A L’Aquila, come a Betlemme, / Tutti in cerca di una casa, / ma soltanto al Re dei Re, / il privilegio di una stalla.’ (Come a Betlemme, Christmas 2009). ‘Nec recisa recedit: il motto del Corpo della Guardia di Finanza, che possiamo ammirare sulla facciata della struttura, sembra bene esprimere quella che il Sindaco ha definito la ferma intenzione di ricostruire la città con la costanza caratteristica di voi abruzzesi…. A questa condizione, L’Aquila, anche se ferita, potrà tornare a volare.’ The full text of the speech is available on the Vatican website: http://www.vatican.va/holy_father/benedict_xvi/speeches/2009/april/documents/hf_ben-xvi_spe_20090428_sisma-laquila_it.html [accessed 23 January 2013].